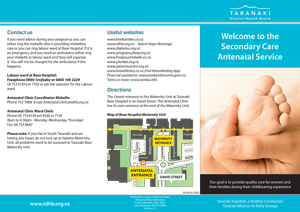 A consultation service is available to all women in the Taranaki area who meet the criteria for consultation as stated in the Guidelines for Referral (Ministry of Health 2012). Lead Maternity Care (LMC) midwives and GPs can refer women for this service. The woman is seen by an obstetrician who assesses and advises the LMC and the woman of a plan of care. A service for women who meet the criteria of transfer of care under the Ministry of Health guidelines (2012). Women that meet this criteria can be referred directly by their GP in early pregnancy e.g. insulin dependent diabetics, severe heart conditions, or LMC if problems or conditions arise such as multiple pregnancy or placenta praevia. If you are transferred to the Secondary Service you will be under the care of the same Obstetrician for regular antenatal appointments. A discussion will take place to decide whether your own midwife or the antenatal clinic midwife will provide midwifery appointments in between visits to the obstetrician with the aim to give you a normal focus on your pregnancy. When you attend in labour or for monitoring outside of normal antenatal clinic hours you will be cared for by a midwife and the duty obstetrician. Once you have given birth to your baby and if your condition allows, you will be transferred back to your original midwife/LMC if you have previously been under the care of the hospital midwife. If you didn’t have a midwife/LMC the antenatal coordinator will help you find one to provide your post natal care..
NB: Unfortunately women cannot choose to come under secondary care, they have to fulfil the criteria in the Ministry of Health guidelines. Click here to view the Ministry of Health Guidelines.